Anywhere you find water, you are likely to find a fisherman. Part sport, part job, part meditation, fishing has always been a popular activity. Though it looks simple, there are a number of different types of fish to catch, techniques to use, and gear to try that depends on both location and your target catch. Your first stop on a fishing excursion should be to the local regulatory agency. If you are booking a charter, this step may have been done for you. However, if you are planning on fishing on your own, a license is almost always required. In the United States, fishing is regulated by state agencies, and a quick search of fishing licenses and the state of interest should give you the information you need. Kids may or may not need a license, and the age of license changes by state. Some states will give you an all-purpose fishing license, while others may have different permit levels for different fish types. Alaska, for example, will give you a fishing license for everything but King Salmon. The salmon fishing license must be purchased separately. Washington state has one license for fish, and a separate license for shellfish like crab, shrimp, and oysters. Read the rules with the license. It will let you know when areas are open for fishing, and which species are in season. This is also a good place to go if you are unsure which species are best to fish for in your area. Local fish and wildlife agencies are usually very easy to talk to about the best species for your locale, boat, and gear. Fishing is something that is as old as humankind. Because of this, there are many different ways that have been adapted to catch fish. Much of it depends on the tools you have, the location where you are fishing, and the season. However, whether you plan to fish off your boat, or just to boat to great on-shore fishing locations, there are many fun ways to experience the joy of catching fish. There are a number of ways to fish off a boat, depending on whether you are a sport or a commercial fisherman, the kind of fish you want, and the tools you have. Even the basic rod and reel fishing can vary depending on your tools. For sport fishermen, here is a basic list of some of the different styles of fishing. Trolling: This is the most common kind of boat fishing. 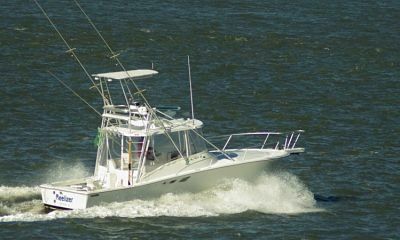 Trolling boats will move at a slow rate to keep bait in motion and increase the chance that fish will see and take it. This can be done in conjunction with other fishing strategies. Most fishing in saltwater has a trolling component. Chumming: This requires taking bloody fish components and putting them in the water to lure sharks near the boat. Jigging: This is a style of fishing where baited rods are bounced up and down on a jig to create an appealing motion for fish to chase. Squid and rockfish are two popular fish species caught this way. Pot or Trap Fishing: This is the most common way that shellfish like lobster, crab, and shrimp are caught. Baited pots/traps are brought out to different areas and left for hours to days. A surface buoy is attached so it is easy to find again and to pull up from the surface. They are then hauled on to the boat and the catch is removed. Seining: This is a common way to catch salmon and/or herring in Alaska. It requires using a net to stop a large school of fish from moving forward. Seiners often use two boats, one at either end of a net that stretches hundreds of feet. The boats use the net to circle a school of fish, and then gather up the bottom of the net like the drawstring of a purse. It is often called purse fishing because of this. Gillnetting: This is a traditional fishing style used by tribes in the Pacific Northwest. A net made of invisible fishing line is stretched across a section of the water during a salmon run. Fish cannot see the net and get caught by the gills as they swim by. Fishermen use their boats to then pull up the net and remove the fish one by one. Kite Fishing: This method of fishing uses a kite on the line to keep bait close to the surface to attract large surface-eating fish, like Tuna and Wahoo. It is believed to have originated in China, and is a popular way to fish both by boat and on land in New Zealand, New Guinea, and Singapore. It is gaining more popularity in the US as well. Spearfishing: This requires standing or swimming with a spear that is used to stab the fish. This can be done by snorkelers or divers looking for a large, slow moving fish, or by those who wade tidepools and want to catch dinner that was trapped by receding waters. Spears can be simple blades on sticks. 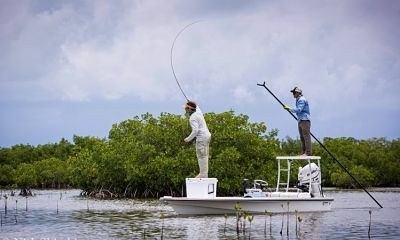 This is a popular way to fish in tropical areas, and in the US is most common in Florida. Fly/Surf Fishing: This kind of fishing requires casting a rod and reel while standing in the surf. It is also called surfcasting or beach casting. This is a common way to catch salmon in the Pacific Northwest, and species like red drum, flounder, and striped bass on the Atlantic coastline. It is one of the most popular forms of saltwater fishing. Clam Digging: This is one of the beachcomber’s favorite fishing activities on every coast. Clams and oysters are a great thing to find, and a wonderful reward for some hard work digging on the beach. There are often specialized tools used to dig depending on the species desired. It is important to always check with the rules and regulations when clams, oysters, and mussels are involved, because health issues like red tide can be potentially deadly during the wrong season. Though there are hundreds of different ways to catch fish, there are a number of items that are needed, or that can make things easier when used. If you have never been fishing before, speak with someone knowledgeable before buying any equipment. There are a lot of things that may look like deals but are inappropriate for the style and/or species of fish you are targeting. Rod and Reel: The basic staples of any fishing trip, the rod and reel you need will vary based on the type of fishing you are doing. Larger, heavier fish will need a stronger rod and stronger line. Fishing like surfcasting requires a longer pole to allow the line the height to get above the surf. The combinations are complicated, and it is always best to consult an expert before you buy. Bait: Again, the best bait, whether live or dead, will vary based on the fishing method and the species desired. Ask around and be willing to try a few things before you find something that works for you. Once you get a few suggestions, feel free to experiment. If all else fails, ask someone at the local marina for advice. Downrigger: For fishing species that like to stay deep, a downrigger is a heavy weight like a small cannonball that keeps your bait at depth even as you move through the water. It is recommended when trolling for any deep-water species. Pot Puller: This is a hydraulic or manual winch that helps wind the rope attached to the trap. It speeds the rate that the line (often hundreds of feet) is pulled, and often has something to keep line from slipping backwards back into the water if you need to pause. No matter where and how you boat, there is likely a vibrant fishing community in your area. Taking a little time to do research and ask the advice of locals will give you a head start in figuring out the best methods, target species, and locations to begin saltwater fishing. If you learn some successful methods and fun locations to go, you will quickly find that the thing that is really hooked is you.